We have been predominately serving customers throughout Arlington, TX and the surrounding areas. Our mission is simple: to provide each and every customer with the best possible fence and the highest level of customer service. We understand how important security is to you, and that is why we have honed our technique for over 50 years to create a perfect fence no matter the project! We have numerous fencing styles and materials available to create you the perfect fence for your needs and property. Every fence is different, and even similar styles can be adjusted to fit your preference. This is why we will work with you during each step of the process so that you end up with a fence that is strong, secure, and a beautiful addition to your landscape. We offer concrete curbing to help keep your fence and yard free from erosion or other damages. We also provide custom fence columns and arbors to beautifully enhance your yard and landscape. If you have an idea for your home, we can make it a reality! As a family run company, we strive our best to make the community a better and safer place to live. Our fences are designed to keep intruders at bay along with giving you a great sense of comfort while at home. Our fences can also be used to keep children away from pools, animals from escaping and to keep other pests from crawling in. Along with functionality, we want our fences to be a beautiful addition to your home. We conform to many styles so that you can have a fence that fits your property’s aesthetic in a lovely way. Our iron arbors add class and elegance to patios, gates, and walkways, and our decorative iron emblems add personalized flair to any gate. While it may seem tempting to construct your own fence or to use another contractor, it’s crucial that your fence is built up to code and installed with the best practices in mind. A shoddily installed fence may cause erosion or other yard problems, and it likely will topple over at the first touch. With Rustic Fence, your new fence is guaranteed to stand strong against the elements to keep you safe at all times. We offer a full warranty on all of our products as well so that you can always be sure of the quality. We take great pride in the materials we use, our craftsmanship, and every step of the installation process. If you have any questions, our expert customer service team is always available and happy to help. With Rustic Fence, you are getting over 50 years of experience put into your next fence. Our passion has always been fences, and we continue to look for new ways of innovating the industry and expanding our customer service. 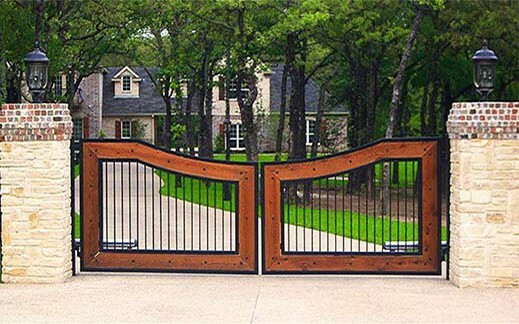 To keep your residential property in Arlington, TX safe at all times, Rustic Fence is ready to help! We are committed to using only the highest quality, commercial-grade fencing materials available and offer warranties for all our products. Learn more about our product guarantee. We value communication and will work with you every step of the way to ensure you get the right fence for your business. Our installers are aware of strict industry safety standards to ensure they stay safe while they are on the job as well as to protect your valuable employees and equipment. You have heard the saying, “It’s not what you say, it’s how you say it” and here at Rustic Fence we believe the same principle applies to our experience, it’s not necessarily what you know, it’s how you apply it. Professionalism is all about using the information and experience you have to drive your creative and innovative abilities to overcome obstacles in your path. Our team here at Rustic Fence takes pride in our line of work and takes pleasure in providing our customers with the highest grade of professionalism. Rustic Fence has been the market leader in residential fencing because of our passion for continually learning and developing ways to build a better fence. For 50 years we have amassed a stockpile of experience and information that has helped us to move forward every day in our mission to build the best fence for our community. You can contact us today for a free estimate on your next fence. We will work with you no matter how large or small the project may be, and if there’s anything extra you’d like, we love customizing fences to your exact liking!